挽吻三尺弛 만물삼척이 She pulled her lips stretching them three cheok (尺, 1 cheok roughly equals 36cm). 唯與婢僕二 유여비복이 giving her just two servants. Habaek was greatly angered with her daughter [saying], “You did not follow what I taught you and in the end have brought shame on my house. Ordering [attendants] left and right to pull her lips, they were lengthened to three cheok. She banished (貶) her to the middle of Ubal waters. Ubal is the name of a swamp; today it is south of Taebaek-san mountain (太白山). 奇獸行駓騃 기수행부애 a strange creature clumsily moving around. 引得坐石女 인득좌석녀 he pulled in the girl sitting on a rock. 唇長不能言 진장불능언 with long lips she was unable to speak. 三截乃啓齒 삼절내계치 Cutting [them] three times her teeth could open. The king had the fisherman catch it with a net. The net was shredded apart. Then using an iron net he was able to pull in a girl. Sitting on a rock she emerged. [Only] after [the king] ordered [her] lips cut three times [could] she speak. 仍以別宮置 잉이별궁치 he had a separate room [for her] prepared in the palace. 懷日生朱蒙 회일생주몽 Embracing the sunlight she gave birth to Jumong. 是歲歲在癸 시세세재계 The time was the Gye[hye] (癸亥) year. 啼聲亦甚偉 제성역심위 [his] crying, too, was extremely great. 觀者皆驚悸 관자개경계 people who saw it were all astonished. 群馬皆不履 군마개불이 [but] the herd would not trample it. 百獸皆擁衛 백수개옹위 [but] a hundred animals protected it. He had men leave it with the horses [but] the herd would not trample it. They abandoned it deep in the mountains [but] a hundred animals protected it. [Even] on days of cloud and rain the egg always had the sun shining on it. The king took the egg and sent it back to [its] mother who took care of it. Finally the egg hatched and there was a boy (男 lit. ‘man’). Within a month all his speech was accurate (實). 經月言語始 경웡언어시 within a month he began to speak. 臥不能安睡 와불능안수 and [even] lying down he could not sleep peacefully. 其弓不虛掎 기궁불허기 this bow he did not wantonly pull. His mother made a bow and arrows together using brier (蓽). By himself he shot at the flies above the spinning wheel (紡車); the arrows he released [all] hit their mark. In Buyeo a good archer was called a jumong (朱蒙). 才能日漸備 재능일점비 he gradually attained talents by the day. 其心生妬忌 기심생투기 envy grew in his heart. 欲以試厥志 욕이시궐지 he meant to test his intentions. 厮牧良可恥 시목양가치 being a horse herder was truly shameful. 離別誠未易 이별성본역 it truly was not easy to separate. His mother spoke [to him]. 潛然抆淸淚 잠연문청루 wiped the clean tears that engulfed [them]. 我亦常痛痞 아역상통비 I also am constantly in pain. 郡馬皆突走 군마개돌주 the herd all bolted off. 始覺是駿驥 시각시준기 [so] they could tell it was a superior junma steed. According to the Dojeon (道典) the horses ridden by Jumong were all called gwaga (果下). 酸通不受飼 산통불수사 the burning pain stopped it from receiving its feed. 却與駑駘似 각여노태사 it resembled the most inferior horse. 豫馬此卽是 예마차즉시 and as expected [gave] that horse [to Jumong]. 日夜屢加餧 일야루가위 and day and night it gradually ate great amounts. Going to the horse pastures (馬牧) [she] wildly cracked a long whip and the herd all bolted in surprise. One horse jumped a two jang fence [whereupon] Jumong knew it to be a junma steed in flight. Secretly he stuck needles in beneath its tongue. The horse’s tongue hurt and it could neither [drink] water nor eat grass and became severely emaciated. The king visited the horse pastures and seeing most of the horses were well fed was greatly pleased. He rewarded (錫) Jumong with the emaciated [one]. Having acquired it, Jumong pulled out the needles and increased its feed. 其人共多智 기인공다지 they all shared great wisdom. There was O’i (烏伊), Mari (摩離) and Hapbu (陜父). 南行至淹滯 남행지엄체 Journeying south, they reached the Eomche [river]. Another name is the Gaesa-su (蓋斯水), it is to the northeast of the present day Amnok river (鴨綠江). 欲渡無舟艤 욕도무주의 They wanted to cross but there was no boat. With these words he struck the water with his bow, whereupon fish and turtles floated up and, emerging from the water, formed a bridge. Jumong [and his friends] crossed. Shortly after the pursuing soldiers arrived. 避難至於此 피난지어차 has fled from difficulty and reached here. 始乃得渡矣 시내득도의 thereupon they were able to cross. 上橋橋旋圮 상교교선비 [but] when they went up the bridge, it twisted and collapsed. [When] the soldiers arrived at the river, the fish and turtle bridge disintegrated; those already on the bridge all plunged [into the water] and died. 來作神母使 내작신모사 they became messengers of the divine mother (神母). Whereupon he pulled his bow and fired. With one arrow he felled them all (一矢俱擧) and, opening their throats, obtained the barley seeds. Splashing water on the pigeons they came back to life and flew away, etc. This is the first part of Yi Gyu-bo’s (李奎報 1168-1241) Dongmyeongwang-pyeon (東明王篇 ‘Ballad of King Dongmyeong’) famous both for being Korea’s earliest known example of epic narrative verse and also for its detailed rendition of the Jumong legend, the mythical founder of Goguryeo. One interesting thing to perhaps note is how the structure alternates between verse and prose in a manner not dissimilar to the chang aria (唱) and aniri recitative (아니리) passages of pansori which did not itself become fully developed until the 18th century. Obviously this is not unique to Korean oral literature and in this case the prose sections are strangely repetitive and frequently add little elaboration to the verse so it’s hard to know why Yi Gyubo wrote them like this. NB: Text and characters in purple indicate where I am most uncertain of the meaning. Note also, use of “etc” translates 云云 which regularly appears; there is no abridgement in the translation. [But] subsequently reading the Weishu (魏書) and Daodian (道典 perhaps refers to the Tongdian 通典), they [both] recorded this story though they were brief and not detailed. Perhaps this is the meaning of ‘being detailed on domestic [affairs] and rough on foreign [matters]’. Then, in the 4th month of Gyechuk (癸丑, 1193), [I] acquired the Old History of the Three Kingdoms (舊三國史) and [upon] reading the Basic Annal section (本記) [discovered that] the vestiges (迹) of those supernatural (神異) [happenings] were related to a greater extent (踰) than matters of [this] world. Things [I] had at first not been able to believe, [I] had considered them demons (鬼) and phantoms (幻), [but] upon reading deeply [some] three times [I] gradually [realised] (漸涉) that its origin was not devilish (幻) but holy (聖). [They were] not demons but gods. What is more (況), would a handwritten book of national history have falsely transmitted these [things]?! Lord Kim Busik (金公富軾) recompiled the national history [but] significantly abridged (略) the story (其事). Thinking about this, the lord [wanted to] make a book of national history which corrected worldly [matters] (矯世), it was not good to have exceptionally strange stories (大異之事) [that would be] shown to later generations and so perhaps [therefore] he omitted them. Examining further, in the basic annal of Tang [emperor] Xuanzong (玄宗) [and] the biography of [his consort] Yang-guifei (楊貴妃), there are no stories of fangshi Taoist wizards (方士) ascending to heaven [or] entering [down] to earth; only the poet Bai Letian (白樂天) was afraid that these stories would disappear (淪沒 lit. ‘sink in water’) [and so] he composed a song with which to record (志) them. These were in fact preposterous (荒), lewd (淫), strange (奇) and untrue (誕) stories, but even so [he] sung of them and [thus] showed them to posterity (後). What is more (矧), the story of [King] Dongmyeong is not [something that] dazzles the common people’s eyes through metamorphoses (變化) and the supernatural (神奇), it is an actual divine vestige of the country’s foundation and so if this is not narrated [now] what will there be to see in the future? For this purpose [I] have composed a poem with which to record it; [I] want all those under heaven (夫天下) to know that our country was originally the capital (都) of holy men (聖人). 天皇地皇氏 천황지황씨 [there was] the Celestial Emperor and Earthly Emperor. 體貌多奇異 체모다기이 the shape of their bodies was very strange. 亦備載經史 역비재경사 are all recorded in the classics and histories. 亦感瑤光暐 역감요광위 having sensed the light of the Great Bear constellation. 洪水大禹理 홍수대우리 floods were controlled by Yu the Great (大禹) [of Xia 夏]. 胡髥龍自至 호염용자지 a bearded dragon spontaneously arrived. 靈聖難備記 영성난비기 with difficulty [they] made records of spirits and sages. 風俗例汰侈 풍속예태치 customs invariably (例) became decadent. 神迹少所示 신적소소시 [but] only a small trace of divinity was shown [by them]. 孟夏斗立巳 맹하두립이 in early summer the Great Bear (refers only to the equivalent constellation, duseong 斗星, but with no explicit bear reference) rose in the southeast. The 3rd Shenqiao year of Han was the 4th month of Gab’in [year] (甲寅). 眞是天之子 진시천지자 was truly the son of heaven. [He] took care (牧) of [the baby] and raising it, named him Geumwa (金蛙 ‘golden frog’) making him crown prince. The soothsayer/prime minister (相), Aranbeul (阿蘭弗), said, “The one of the sun (日者) descended from heaven and said [to me], “Soon I will have my grandson establish a kingdom here, you must move away (避). Beside the eastern sea (東海) there is land called Gayeop-won plain (迦葉原); the land is suitable for the five cereals [and so you] should [re]establish your capital [there]. Aranbul [thus] foretold (觀) the king moving the capital. [The new] name was East Buyeo (東夫餘). On [the site of] the old capital, Hae Mosu came as the son of the Celestial Emperor and established [his capital]. 身乘五龍軌 신승오룡궤 [his] body riding a five dragon chariot (五龍軌). 淸樂動鏘洋 청악동장양 [their] clear music was stirring, sonorous and broad. 彩雲浮旖旎 채운부의니 Coloured clouds thickly floated. In the 3rd Shenqiao (神雀) year of the Han, the Imsul year (壬戌, of the sexagenary calendar), the Celestial Emperor sent the crown prince who descended and wandered (遊) [on the site of] the Buyeo king’s old capital. He was name Hae Mosu. From heaven he descended riding a five dragon car (五龍車). [His] followers numbered more than a hundred and they rode on white swans (鵠). Coloured clouds floated up [whilst] the sound of music moved through the clouds. Stopping [on] Ungsim-san mountain (熊心山 ‘bear heart mountain’), [he] spent more than ten days before starting to descend. On his head, he wore a crown (冠) of bird feathers; on his waist a sword of dragon light (龍光之劍). 何是非天賜 하시비천사 what is this if not a celestial bestowing? 從昔所未[目+示] 종석소미시 since long ago, it has not been seen. 暮反天宮裡 모반천궁리 [and] in the evening returning to the inside of the celestial palace. In the morning [he] listened to matters, in the evening [he] ascended to heaven. [People of the] world called him the Young Celestial King (天王郞). 七百八十里 칠백팔십리 seven hundred and eighty li. 羽翮飛易瘁 우핵비역췌 feathers and wings easily tire from flying. 此理復何爾 차리복하이 what principle is this? 城北有淸河 성북유청하 North of the fortress (citadel) is the Cheongha river. The Cheong-ha river (淸河) is the present day Amnok-gang river (鴨綠江). 河伯三女美 하백삼녀미 The three daughters of Habaek were beautiful. The eldest was named Yuhwa (柳花), the next Hwonhwa (萱花) and the youngest Wihwa (葦花). 往遊熊心涘 왕유웅심사 Bear-heart swam in the waters. Bear-heart emerged from the Cheongha and played above the pools. 鏘琅佩玉嗚 장랑패옥오 The jewels hanging from his belt jingle. 綽約顔花媚 작약안화미 His soft, delicate face is beautiful as a flower. His divine form was attractive and pretty (艶麗), his jewels jingled; there was no difference to Han’go (漢皐). 初疑漢皐濱 초의한고빈 At first Han’go was suspicious of the water. 復想洛水沚 복상낙수지 [Then] he thought again of the Naksu river’s sandy bank. 目送頗留意 목송파유의 Casting his eyes it greatly appealed to him. 誠急生繼嗣 송급생계사 he was truly in a hurry to have born a successor. 三女見君來 삼녀견군래 The three daughters saw the lord approaching. 入水尋相避 입수심상피 Entering the water, he search and they avoided. 潛候同來戱 잠후동래희 so that hiding he could watch them play together. 銅室欻然峙 동실훌연치 a copper house suddenly erected itself. 金罇置淳旨 금준치순지 golden cups were set out [filled] with a simple taste. 對酌還徑醉 대작환경취 they drank facing one another and became intoxicated. These girls seeing the king went straight into the water. His attendants said, “Great King, could you not build a palace, wait for the girls to enter and then block the doors?” The king thought to do this. Striking his horse whip on the ground, a copper house suddenly formed magnificently. Inside were set three seats and wine was placed. The girls each sat at one of these seats; facing one another drinking wine, they became drunk etc (云云). 驚走僅顚躓 경주근전지 surprised they ran and almost fell over. The king waited for the three girls to get very drunk, then he hurried out to bolt [the gate]. The girls were surprised and ran; the eldest daughter, Yuhwa, was stopped by the king. 是爲王所止 시위왕소지 was stopped by the king. 遣使急且駛 견사급조사 she dispatched emissaries who speeded forth. 經到海宮邃 경도해궁수 driving it, he arrived deep in the sea palace. The king pointed at the sky and spoke [some words] whereupon a dragon carriage descended from the air. The king and girl got in the carriage, wind and clouds suddenly rose up and they were at the palace. 媒贄有通法 매지유통법 it requires an intermediary and exchange of gifts. Habaek received [the king] with correct ritual and taking [her] seat [or ‘them both sitting’], said, “The way of marriage is conducted according to the rules under heaven. How can [you] behave with such impropriety and insult my family (門宗)? !” etc. 河伯化作鯉 하백화작리 Habaek changed into a carp. 立捕不待跬 입포불대규 [He] did not wait a few steps [before] catching [her]. 搏擊何大鷙 박격하대지 [He] attacked her [like] some great bird of prey. 我爲豺而趨 아위시이추 This one became a dhole [wild dog] and chased after. 置酒相燕喜 치주상연희 She prepared wine and they joyfully feasted together. 並寘女於[車+奇] 병치여어의 And her daughter beside him in the ui. The side of a palanquin (輿) is called a ui (車+奇). 酒醒忽驚起 주성홀경기 [he] sobered up and suddenly stood surprised. Habaek’s wine took seven days to sober up from. 刺革從穹出 자혁종궁출 [he] pierced the leather and went out through the hole. 寂寞不廻騎 적막불회기 Lonely and sad, no news came back. Now Habaek went to the water in front of the garden and changed into a carp. Following the waves she [swam] around. The king changed into an otter and caught her. Habaek then changed into a deer and ran; the king changed into a dhole and pursued her. Habaek changed into a pheasant; the king changed into a hawk and attacked her. With this Habaek [knew] he was truly (誠) the son of the Celestial Emperor. With proper rites they were married, [but Habaek] was afraid that he might not have the heart for [her] daughter. Providing music (樂) and wine, she offered them to the king who became greatly intoxicated. Together with her daughter, they got inside the little leather carriage; riding the dragon carriage, [she] intended to order [it] to ascend to heaven. [But] before the vehicle had emerged from the water, the king sobered up; taking the girl’s golden hairpin, he pierced the leather carriage. Emerging through the hole, he ascended to heaven by himself. See Introduction, part 1, part 2, part 3, part 4 and part 5. The twenty-eight royal burial mounds [stand] forlorn and desolate. [Weathered by] wind and rain year upon year, the lacquer lamps [a term for graves n.116] grow dim. In spring will spontaneously bloom layer upon layer. The emperor’s daughter slowly travels down [from the Yuan capital Beijing] in the Phoenix [i.e. royal] palanquin. In the spring cold, [her] ger tent [has already been] erected and an exorcism performed with sheep fat. Red tears fell first on the peony branch. [King Chungseon] formed a close friendship with [painter/calligrapher] Zhao Zi Ang of the Chinese [Yuan] court. Enjoying music and arts, he was the imperial son-in-law and the Shenyang king. And spent his time drunk at the Ten-thousand Volume Library in Lugou [southeast district of Beijing]. Like star[light], silver candlelight illuminates the crossbar of the palace [gate]. Many [people] climb up to the Peony Pavilion to compose poems. So too will the three calls never again echo around [lit. “surround”] the palace paintwork. [Battered by] wind and rain, the earthen walls of the overgrown garden are leaning over. [Only] pairs of yellow butterflies flit amongst the herbs and flowers. Each year trade ships arrived at the river village. Shadows cast by the red and green pavilions become indistinguishable. Has spent the day reciting poetry watching a white heron. The palace lady returning on her horse beside [King Sin] is [nowhere] to be seen. However now only swallows [remain] flying together with their mates. Cold and sad, [only] the pines of Tundra Swan Pass (Gong-nyeong 鵠嶺, another name for Song’ak Mountain n.141)* [survive] a thousand years. For only when the white clouds blew away was Three Peak Mountain seen. iron dogs (鐵犬): according to the Songgyeong-japgi (Miscellaneous Records of the Pine Capital aka Gaeseong 松京雜記 n.142), “It is said that, ‘Holy monk Doseon (道詵 n.143) determined the site south of Mount Song’ak for the [new Goryeo] capital. A little later, the clouds lifted revealing to the southeast the three peaks, Samgak-san, of Hanyang (漢陽 三角山) which reached the sky. Seeing this, Doseon collapsed in surprise and lamented. They made twelve iron dogs and had them bark in that direction. This is because Samgak was a gyubong (窺峰 n.144) mountain that effected the auspiciousness of Mount Song’ak. (They also placed on a large rock the Sangmyeong-deung (Ever Shining Lantern 常明橙), a type of lantern used to ward away robbers n.145). '” Now to the east of Gaeseong is Jwa’gyeon-ni (座犬里 Sitting Dog Village, referenced in a poem by Kim Yuk (金堉 1580-1658) n.146). Song Eun-myeong 송은명. 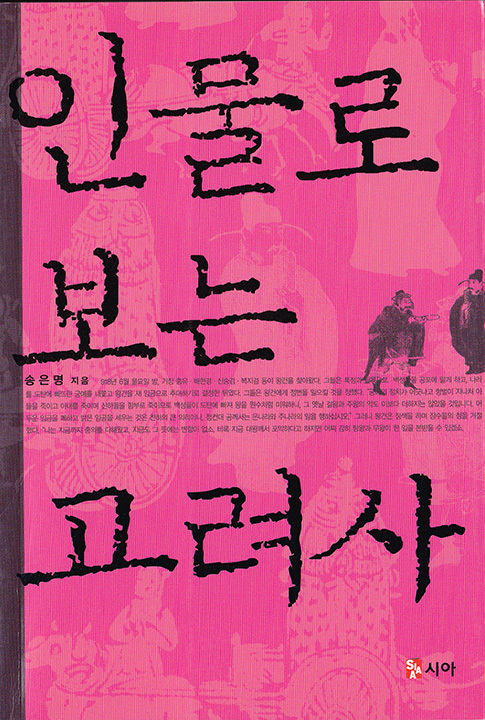 2010: 인물로 보는 고려사 (Looking at Goryeo History through the Personages). Seoul: SIAA 시아출판사. In the following all hanja characters and dates are added by me. Comments in parenthesis are also mine, not the original author’s. I think this book is good popular history writing! Recently, with the production of television dramas dealing with Goryeo history, such as Taejo Wanggeon (태조 왕건), Jeguk’ui achim (제국의 아침 ‘Empire’s Morning’) and Muin-sidae (무인시대 ‘Age of the Military’), interest in Goryeo is steadily increasing. Actually, compared to the history of the Three Kingdoms and [later] Joseon period, it is not only the wider public, but to researchers also that [Goryeo history] is an unknown terra incognita (the double “unknown” is present in the original Korean 알려지지 않은 미지). Whilst possessing five hundred years of history similar to Joseon, owing to a lack of surviving relics and sources, the period of our [Korean] history most enveloped in a dark veil is none other than Goryeo; what is worse, [Goryeo] history is understood [only] as [having had] a society less developed than Joseon and as having been [nothing more than] a period of transition. Well then, what kind of country was Goryeo? What sort of events were unfolding in this land (referring to modern Korea) one thousand years ago? To find the answer there is first a need to examine the relationship between history and [its] personages. This kind of investigation (고민 lit. ‘troubled anguish of thought’ – but used to mean “thinking hard about something”) which was presented in the previous volume [of this series] Looking at Joseon History through Personages, continues in a similar manner in this book as well. If, as it is said, the importance of history is [in allowing us to] reflect on the present through records of the past, then there is no more effective medium than [through] the lives of personages. This book tries to shine new light on the historical characteristics and significance of Goryeo through [looking at] the lives of personages from the Goryeo period. [I] hope that [the reader] can feel the vitality (생동감) and immediacy (현장감) of history through the energetic (생생하다 lit. ‘lively’) lives of the personages included in this book. Well then, what kind of historical characteristics does Goryeo, [a country which so] embellished the medieval era of Korea, possess? Before beginning the main text, let us consider some characteristics of the Goryeo period. First of all, except for the period of stability under King Munjong (文宗 r.1046-83) the majority of the [Goryeo] period experienced [continuous] states of disorder, both internally and externally. Externally there were continuous invasions; this was because [Goryeo] was unable to actively deal with the state of constantly changing power on the Chinese continent where, following the Tang, [came] the [Khitan] Liao, the Song, the [Jurchen] Jin and the [Mongol] Yuan. [Goryeo’s] northern expansion policy (北進政策) advocated from the foundation of the dynasty also played a role in the friction with the Chinese dynasties. Except for the Song, Goryeo was a number of times at war or military confrontation with Liao, Jin and Yuan. Through this process, it was impossible for [Goryeo’s] national strength not to be spent and the land exhausted. Internally the country was impeded by both large and small disturbances. In particular, beginning with the Yi Jagyeom (李資謙 d.1126) rebellion (1122) during the middle period, [followed by] Myocheong’s (妙淸 d.1135) rebellion (1135) and then the military uprising, social disturbances intensified as the ruling class changed and eventually [Goryeo] came under the rule of the Yuan. Surviving for more than five hundred years whilst experiencing these internal and external trials, Goryeo possessed the following historical characteristics. Firstly, Goryeo was an ‘aristocratic country’ [meaning] a class maintaining special rights, the aristocracy, controlled the country. The aristocratic class that ruled Goryeo changed slightly (in fact significantly) as a result of repeated sudden rises and falls; the ruling class was transformed [from] the powerful clans (豪族) who participated in the unification of the Later Three Kingdoms (後三國) and founding [of Goryeo; then] as royal authority and a system of governance was established, [there were first] the maternal relatives (外戚) who married into the royal clan and the hereditary aristocracy (門閥貴族) bureaucratized through the state examination system [who were, in turn, to experience] military coup d’état and, later, the Mongol invasion and period of [Mongol] Yuan rule [from which time] until the end of the dynasty the influential clans [that collaborated with the Mongols] (權門勢族 lit. ‘influential houses’) were the dominant ruling class. The aristocracy led Goryeo politics, economics, society and culture and left many achievements, but with a monopoly on power and wealth, there was despotism giving birth to many abuses which ultimately caused the weakening of national strength and [finally] its downfall. Secondly, Goryeo was a ‘Buddhist country’ making Buddhism the state religion. Following the initiation of the state examination system there emerged as bureaucrats scholars who had studied Confucianism, but just as it appeared in Wang Geon’s Ten Injunctions (訓要十條), Buddhism remained the fundamental ideology of the country. During the early period, the scripture focused doctrinal school (敎宗) which had received the support of the king and hereditary nobles, namely the Hwa’eom-jong (華嚴宗) and Cheontae-jong (天台宗) sects became the intellectual basis for leading the country; following the military coup, the meditation centered Seon-jong sect (禪宗) which had the support of the military regime and pro-Mongol clans (權門勢族), and the Jogye-jong sect (曹溪宗) which united the Nine Mountain seon temples (九山禪門), [together] led the Buddhist establishment. There was an inseparably intimate relationship between those in power and Buddhism; high monks were invariably at the centre of national reform and restoration. However, due to various abuses and side effects of excessively preferential policies [towards] Buddhism, during the later period Buddhism was completely rejected by the new [class of] sadaebu (士大夫) scholar-officials. Thirdly, during the Goryeo period sahak private academies (私學) greatly developed. With the initiation of the Confucian based gwageo (科擧) civil service examination, [sons of] regional clans (土豪) and commoners (良民) such as provincial officials (鄕吏) [all] sought social advancement through this [system]. As a result the national Gukja-gam (國子監) academy [took on a] nominal [position] whilst private schools established by Confucian scholars, starting with the Gujae-hakdang academy (九齋學堂) of Choe Chung (崔沖 984-1068), became prevalent. These Confucian scholars were mostly of bureaucratic backgrounds having emerged from the jigonggeo (知貢擧) offices which supervised the gwageo examination, as such there was nothing more effective [for them] than the private academies. Fourthly, for a period military officials seized control of the government. This is an anomaly of [Korean] dynastic history where, uniquely, governance was controlled by the military. Following the initiation of the gwageo system, civil officials including the hereditary nobility dominated (총괄) state governance; the civil officials also had command over the military. On account of this the military officials were completely excluded from power resulting in the 1170 coup d’état. The military leaders Yi Uibang (李義方 d.1174), Jeong Jungbu (鄭仲夫 1106-79), Gyeong Daeseung (慶大升 1154-1183), Yi Uimin (李義旼 d.1196) and Choe Chungheon (崔忠獻 1149-1219) ruled Goryeo for around eighty years until the kingship was restored during the Yuan dynasty. Together with these characteristics, in order to approach the five hundred years of the Goryeo dynasty in a more interesting way, [I] have tried to narrate Goryeo history through twenty-eight lives that were at the centre of the era. Looking into history through the life of an individual is an extremely interesting task, and [I] believe this is precisely the attraction of the ‘Looking at History through Personages’ series. Of course, seeing this is only one person’s writing (talking about himself), the individual’s bias and lack of historical awareness will likely be revealed. I request much whipping. Wang Geon (王建 r.918-943) – Opening the gates of Goryeo’s 500 years. Gwang-jong (光宗 r.949-975) – Centralization of power towards the strengthening of royal authority; preparing the foundation of centralized authority. Gyun’yeo (均如 923-973) – Taking the lead in the unification and popularization of Buddhism. Seong-jong (成宗 r.981-997) – Receiving the title of “sagacious ruler” (聖君). Seo Hui (徐熙 942-98) – A master diplomat who repelled the Khitan army with a single word. Gang Jo (康兆 ?-1010) – A traitor [but who] maintained his allegiance to [his] country. Yang Gyu (楊規 ?-1011) – Leave the Khitan army to me! Gang Gamchan (姜邯贊 948-1031) – The famous general of the Great Victory of Gwiju (龜州大捷). Mun-jong (文宗 r.1046-1083) – Leading the highest golden age of Goryeo. Choe Chung (崔沖 984-1068) – Establishing the craze for sahak private academies (私學). Yi Jayeon (李子淵 1003-1061) – The glory of a family attained through intermarriage with the royal house. Uicheon (義天 1055-1101) – The prince who became a monk. Yun Gwan (尹瓘 ?-1111) – An eternity of anguish; a moment of glory. Yi Jagyeom (李資謙 ?-1126) – Dreaming of a usurption of the thrown [by] the queen’s clan. Myocheong (妙淸 ?-1135) – The Dream of a [truly] independent [from the Khitan Liao] country that vanished together with the failure of a revolution. Jeong Jungbu (鄭仲夫 1106-1179) – Opening the doors to the period of military [rule] through coup d’état. Choe Chungheon (崔忠獻 1149-1219) – The longest ruling dictatorship in the history of the military regime. Yi Gyubo (李奎報 1168-1241) – The great writer [and poet] who established the revival of Goryeo literature. Jinul (知訥 1158-1210) – Creating the Jogye-jong sect (曹溪宗) and [thus] contributing to the unification of [Korean] Buddhism. Kim Yunhu (金允侯) – [From] origins of [being] a monk, rising to the [highest military] position of sangjanggun (上將軍). Bae Jungson (裵仲孫 ?-1271) – Leading the Goryeo partisans, the Sambyeolcho (三別抄), and resisting against the Mongols. Il’yeon (一然 1206-1289) – Writer of the Samguk-yusa, valued [by Choe Namseon 1890-1957] higher than the Samguk-sagi. An Hyang (安珦 1243-1306) – The Zhu Xi (朱熹) of the East who tried to rearm Goryeo with Neo-Confucianism (性理學 seongni-hak). Yi Jehyeon (李齊賢 1287-1367) – A realist in an age of chaos. Gongmin-wang (恭愍王 r.1351-1374) – Writhing [struggle] for the restoration of Goryeo. Choe Yeong (崔瑩 1316-1388) – The failed dream of a Liaodong conquest [campaign]. Jeong Mongju (鄭夢周 1337-1392) – Sharing the fate of the Goryeo dynasty.